We often think of "fiery trials" as occasions of great pain and sorrow, somehow, perhaps, undeserved, but ours under the sovereignty of God nonetheless. Our focus is most often on the "fiery" rather than the "trials" or the subsequent phrase "to test you." We see "fiery" as the descriptor and focus on the intensity of the circumstances, or on the inconvenience, or the difficulty, or the level of pain and sorrow produced, so we are constantly asking, "Is this a fiery trial or is it just some other condition I have deal with?" as though we have different responses to varying levels of life complexity. But what if "fiery trials" doesn't describe the nature or character of those circumstances in relation to our comfort level? What if the focus of "fiery trials" is not our experience of our circumstances but the divine purpose, the providence behind our circumstances? What if "fiery trials" doesn't point to our pain but to God's glory, not to our inconvenience but to God's wisdom, not to our sorrow but to God's sovereignty, not to our suffering but to God's mercy?! 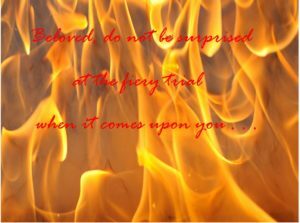 What if trials are fiery not because of what they are but what they do? Proverbs 17:3 (ESV) 3 The crucible is for silver, and the furnace is for gold, and the LORD tests hearts. The furnace is a place of flame, fire, and the crucible is that container that holds the substance to be purified in the flame of the furnace. If Peter is thinking of this OT Proverb, then he may be thinking of fiery trials not in terms of the intensity of the heat of the fire but of the purified product that will result from the work of the flame. Circumstances God sovereignly adds to our lives to refine and prove us call on us to see and understand the character and nature of God's heart and will in a new, expanded light. Circumstances God sovereignly adds to our lives to refine and prove us call on us to seek additional spiritual support from the Holy Spirit, from God's word, and form our Christian brothers and sisters in contrast to the self-reliance and spiritual isolation we all too often indulge. Circumstances God sovereignly adds to our lives to refine and prove us call on us to express and utilize spiritual gifts no required under other circumstances. Circumstances God sovereignly adds to our lives to refine and prove us call on us to a "non-ordinary" fervency and frequency of prayer, which is itself the essential expression of the health of our relationship with God. Circumstances God sovereignly adds to our lives to refine and prove us call on us to sever our love for the world, which despite the bones it throws our way from time to time, has no love for us and deserves no love from us. To discover the sin that hides and lurks safely in the shadows of the heart and soul when the spotlight is not on it, including sin in the attitudes, affections, and actions. To develop an attitude of "bitterness" toward sin, finding it as awful and distasteful as it really is compared to the holiness, purity, and glorious beauty of God our Creator. To practice the prevention of sin, in ourselves, and to whatever degree we can rightly do so, in others. This is the function of personal and corporate discipleship. Circumstances God sovereignly adds to our lives to refine and prove us call on us grow in grace. To discover God's grace active in our situations. To exercise God's gift of grace while enduring and gaining the most spiritual value from our situations. To increase in God's grace toward our own weaknesses, toward others in their weakness or sin (especially as it is directed toward us), toward God and the wisdom of his timing and processes in our lives. Circumstances God sovereignly adds to our lives to refine and prove us wean "us from the world and to the completing of [our] conformity to Christ." Take a good look at the fiery trials that assail your life, but see through the flames to the One who masterfully wields them to purify your heart and life making you daily more and more like His beloved Son, in Whom He is well pleased.